The online N24 community has decided to name November 24 as N24 Awareness Day. We are encouraging bloggers and tweeters and anyone else with a platform to help spread awareness and knowledge of Non-24-Hour Sleep-Wake Disorder (N24). This would be an appropriate time to review some events in 2013 relevant to N24. One important advance was a paper by Kitamura et al. which measured the intrinsic circadian period in 6 patients with N24. They compared it with two groups of individuals without a circadian disorder. One group had an intermediate circadian preference. The other group had an evening preference. 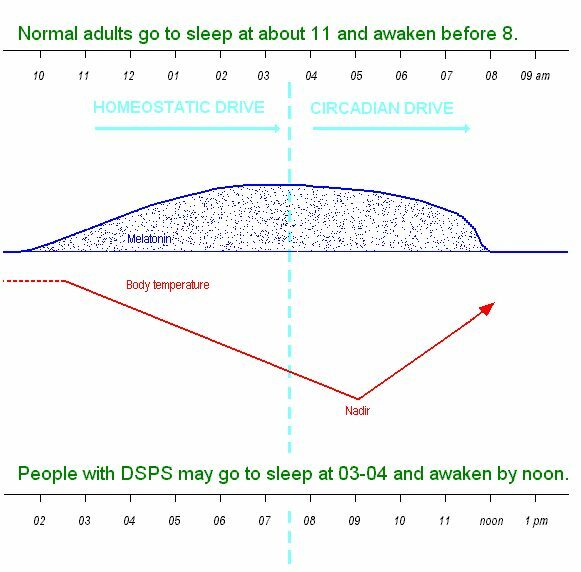 The latter group however did not have DSPS, only a preference for being active later in the day. Kitmura et al. found that the intrinsic period of the N24s was 24.5 hours, which was significantly longer than that of the intermediate types, but not significantly longer than that of the evening types. The average period of the N24s was longer than that of the evening types but because of the great degree of overlap between those groups the difference was not significant. The longest period found in an evening type subject was nearly identical to the longest period among the N24 subjects (around 24.7 hours). These results suggest that a longer-than-average intrinsic period is a component of N24, but it is not the only causative factor. Other factors, such as differences in phase angle between sleep and temperature rhythms, as found in several studies, may play a role. Another paper, by An et al. did not discuss N24 explicitly, but the results may have import for those with the condition. They studied the effect of Vasoactive Intestinal Peptide (VIP) on shifting of circadian rhythms in mice and in cell cultures from the SCN. They found that VIP depending on time and dose could either enhance or reduce the mutual synchronization of SCN cells. Further, when SCN cells were less tightly synchronized together, they adapted more quickly to phase changes. This suggests that by manipulation of VIP levels it may be possible to increase the adaptability of the SCN to phase changes. Since N24s with a longer period need to change phase every day if they are trying to maintain a normal schedule, this approach might be of help. It might also help people with DSPS when trying to shift to an earlier sleep phase. Kitamura S, Hida A, Enomoto M, Watanabe M, Katayose Y, Nozaki K, Aritake S, Higuchi S, Moriguchi Y, Kamei Y, Mishima K. Intrinsic circadian period of sighted patients with circadian rhythm sleep disorder, free-running type.Biol Psychiatry. 2013 Jan 1;73(1):63-9. An S, Harang R, Meeker K, Granados-Fuentes D, Tsai CA, Mazuski C, Kim J, Doyle FJ 3rd, Petzold LR, Herzog ED. A neuropeptide speeds circadian entrainment by reducing intercellular synchrony. Proc Natl Acad Sci U S A. 2013 Nov 12;110(46):E4355-61. We learned in middle school that there are two, and only two, types of light sensitive cells in the retina, rods and cones, right? Right, that’s what we learned. Could be the science teachers are still saying that, since the third type was discovered within the last decade. The mammalian retina consists of many layers. One might think that light would first strike the rods and cones, the photosensitive cells we use for vision. But our retina is “inside out” compared to the more logical layout found in the octopus and its relatives; light in our eyes must travel through the many retinal layers to reach our rods and cones. One of the first layers the light reaches is composed of the one and a half million ganglion cells, most of which are involved in processing visual (image forming) information. Fewer than 25000, some say just a couple thousand, of these cells are themselves sensitive to light. They function as light meters and they function much more slowly than the rods and cones, not registering abrupt fluctuations in light intensity. These cells project their axons to several brain centers including the suprachiasmatic nuclei, SCN, the “body clock” through the retinohypothalamic tract. They thus provide the major clue for the adjustment of the body clock. The incoming information about light intensity is also used to adjust pupil size (narrowing of pupils in bright light) and to regulate physical activity and melatonin synthesis. Late in the previous century, scientists weren’t sure that there existed ipRGCs, and those who thought that they do exist were arguing about what opsin, what pigment, they use. Is it melanopsin or one of the cryptochromes, which also respond to blue light? One argument against melanopsin was that it resembles invertebrate opsins and differs from other opsin photopigments found in vertebrates. Again, as with our hormone melatonin, it was research on specialized light-sensitive cells of frog skin which provided answers. It has been known for a while that even when vision is lost, the light-sensitive ganglion cells may function perfectly. Recent research on mice at Salk Institute shows that the opposite also is true. A way was found to knock out the ipRGCs while leaving the rods and cones alone. The mice became arrhythmic, but still could see. Update: I’ve just discovered a wonderful post, Why can’t human eyes detect all wavelengths?, on the blog of Xenophilius Lovegood (!?). Xeno, claiming to be “a slightly mad scientist”, explains the physical / chemical / electrical changes in the rods and cones as they react to light. He also has a bit about the ipRGCs. Recommended. Practice Parameters for the Use of Light Therapy in the Treatment of Sleep Disorders appeared in SLEEP, Vol. 22, No. 5, 1999. The authors, Chesson et al, were all connected to universities and medical institutions in the USA. The clinical guidelines developed by the Standards of Practice Committee were reviewed and approved by the Board of Directors of the American Academy of Sleep Medicine. The guidelines provide recommendations for the practice of sleep medicine in North America regarding the use of light therapy for treatment of various sleep disorders. As the PDF apparently no longer is available on the Internet and the document is found only in Google’s html version, I’m offering some excerpts here. I’m leaving out altogether the sections on shift work and other voluntary shifts of sleep-wake schedules, sleep disturbances in the elderly, jet lag and Seasonal Affective Disorder (SAD). Update, December 2010: the PDF is now here, hat tip to ttt. From the INTRODUCTION: Endogenous circadian rhythms are in large part regulated by the hypothalamic suprachiasmatic nuclei (SCN). The SCN are key regulators of sleep, as they regulate rhythms that promote sleep and wakening. It is now recognized that a number of sleep disorders are linked to abnormal circadian rhythms or to a lack of coordination of the sleep-wake cycle with the individual’s circadian rhythms. One of the most potent external factors that can alter the period of the SCN is light exposure. From BACKGROUND: Over the past two decades, laboratory studies have demonstrated that scheduled light exposure can produce a dose-dependent phase shift in the endogenous circadian rhythms of a variety of variables. These variables include plasma or saliva melatonin, core body temperature, cortisol and a propensity to sleep. The rationale for the use of light therapy evolves from the observation that circadian rhythms in humans can be phase-shifted by scheduled exposure to light. Because of an endogenous pattern of light sensitivity, the direction of the phase shift varies with the timing of the light exposure. The responses of circadian rhythms to light exposure have been summarized in Phase Response Curves (PRC). The PRC appears phase-locked to the core body temperature and plasma melatonin concentration rhythm. In healthy young subjects, with a normal sleep pattern and temperature curve, the core body temperature minimum typically occurs about two hours before habitual wake time (around 4 to 5 a.m.). Light exposure prior to the endogenous minimum of the core body temperature will shift rhythms to a later clock time (i.e., will delay rhythms). Light exposure just after the endogenous circadian body temperature minimum will shift rhythms to an earlier clock time (i.e., will advance rhythms). Rarely, light therapy may provoke a hypomanic state in patients with bipolar affective disorders. TREATMENT OBJECTIVES, INDICATIONS and FOLLOW-UP: Treatment is indicated only if there is a desire on the patient’s part to resolve symptoms. The objective is to achieve a sleep onset at either a more socially acceptable time or at a time that provides sufficient sleep in keeping with the work schedule or lifestyle. Objective documentation is generally limited to a shift in the core body temperature minimum, a shift in the onset of dim light melatonin secretion or in the peak of the melatonin rhythm, information the patient has recorded in diaries, or actigraphic measurement of rest/activity patterns. Oops, sorry. Got a little ahead of myself there. Melatonin should have been explained before that more technical stuff. Melatonin is a hormone produced and secreted by the pineal, a tiny, midbrain gland which doesn’t seem to have any other tasks. The pineal takes its orders from a nearby organ which Mary Poppins surely should have sung about, the suprachiasmatic nuclei. However you choose to pronounce that, it’s a whole dance tune in itself. The SCN (for short) is our central biological clock. If totally isolated from outside cues about time, it will keep running on its own “almost a day” (= circadian) cycles virtually indefinitely. Cells from mammalian SCN do so, in fact, in a dish. The body clock needs to be reset daily. The SCN receives (or receive, if you prefer) information from the retina directly along a pathway called the retino-hypothalamic tract. And yes, the SCN is located in the hypothalamus, in the brain. The vital information which the SCN processes, is sent to it by special light-sensitive cells in the retina in the back of the eye. This information about light received at the retina has nothing to do with vision. It tells our system when day and night are. There can be other cues as well, such as mealtimes and activities, but light is by far the strongest. The rhythms of core body temperature (CBT) and melatonin secretion, at the least, need to be coordinated with each other and with the cycle of light/dark to allow us to fill our need for one long sleep-session, preferably at night. Bright light banishes melatonin from the blood and stops / delays the secretion of it. We all know people who’d rather sleep 10 p.m. to 6 a.m. or midnight to 8 a.m. Those schedules are within the normal range. When I was a kid, medicine and science thought that the normal range should be achievable for everyone. It is not.